It’s our first Friday of November, and on Twitter, Fridays are a little more special than the other days of the week! On Friday, people use the hashtags #FollowFriday and #FF to suggest people they think others should follow. It’s a very useful way to build your Professional Learning Network. 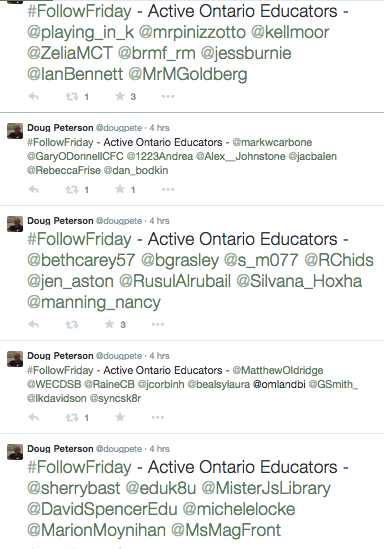 For example, Doug Peterson (@dougpete on Twitter) who works hard to make sure Ontario educators stay connected, posts many “Active Ontario Educators” on Twitter every Friday using the #FollowFriday hashtag. 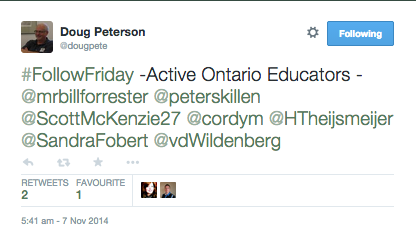 As well, we are posting this today as 1536 Ontario educators are attending #BIT14 in Niagara Falls. Ron Canual asks us to consider those who are not here and to carefully consider the echo chamber in the room. Next year, bring a friend who is not part of that echo chamber. But people don’t have to physically attend conferences to benefit from the learning. We have already talked about how to follow learners on Twitter while they are at conferences and learning sessions. Sometimes conferences are livestreamed and recorded so that you can “attend” from a distance. For example, today at 1 p.m., we will livestream our OSSEMOOC presentation for anyone who would like to collaborate online with the conference attendees. You can watch and connect here. Not all conferences have a physical location. Check out the K12 Online conference for anywhere, anytime learning from colleagues around the world. Congratulations on your first week of connected learning. Next week, we will start to think about how connecting leads to curating and collaborating. Thank you OSSEMOOC for this wonderful series. It is inspirational and practical. There are so many amazing teachers sharing via twitter and I agree that it is a rich & ‘nurturing’ PLN to grow and tend. I wish to share @jsm2272 (Julie Millan); @lisegaluga ; @Bigideasinedu (Deborah McCallum) and @TDSBLibrary (TDSB Professional Library) as stellar examples. Thanks so much for sharing those awesome twitter accounts! Great work on the 10 minutes a day initiative! I have been leaving comments but they don’t appear!? What do you think is happening? Hi Julie! Thank you for taking the time to comment. We just found your comments in our spam folder. I confess neglecting to check it lately. I apologize, and I am so glad you told us your comments were missing! Hopefully everything is visible now. Thanks for your contribution.